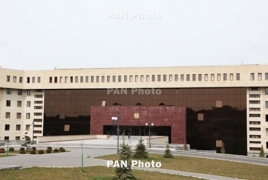 PanARMENIAN.Net - Armenia’s Deputy Defense Minister Gabriel Balayan has described Azerbaijani media reports alleging Baku has proposed Yerevan to exchange prisoners of war (POW) as an "absolute lie", stressing there are no prisoners of war either in Armenia or in Artsakh. “Before I left the Defense Ministry, i.e. at 10:20am, there was no such a proposal. As a matter of legal practice, we receive such proposals mainly through the channels of the Red Cross,” he told reporters after a Cabinet meeting on Thursday, November 8. “I have no idea what that's all about given the fact that there are no prisoners of war in Armenia or Artsakh. Our works is transparent,” he said. According to Balayan, similar Azerbaijani reports are addressed to domestic and foreign stakeholders and are groundless.